Your ISP restricts or blocks outbound connections to TCP port 25 so you are unable to have the Synchronet Mail Server perform Direct Delivery of email messages to public mail (SMTP) servers which require mail delivery on TCP port 25. 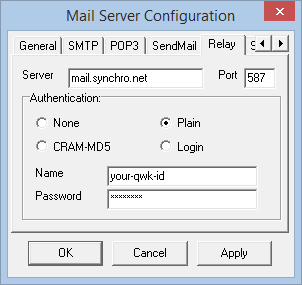 Use Vertrauen's Synchronet Mail Server (on TCP port 587) to relay your outbound Internet mail. If you do not already have a QWK networking account on Vertrauen, create one. If running Synchronet Control Panel for Windows, shut it down. Note: the “Use Relay Server” radio button must be checked on the “SendMail” tab for the “Relay” tab shown above to appear in the configuration dialog box. This relay service can be terminated for one or all clients for any reason at any time. Most notably, if you send SPAM through Vertrauen, you will lose all access to Vertrauen's services, including this one. Your relayed mail messages are not private and there cannot be any expectation of privacy.